We’d love your help. Let us know what’s wrong with this preview of Cold Blood, Hot Sea by Charlene D'Avanzo. "When it comes to research vessels, labs and scientific protoc "Charlene D'Avanzo is a marine ecologist who has written a first crime novel that makes her scientific specialty exciting… The central character, Mara Tusconi, is a Maine oceanographer who thinks there's something fishy (pardon the pun) about the death of a colleague on board a research ship." 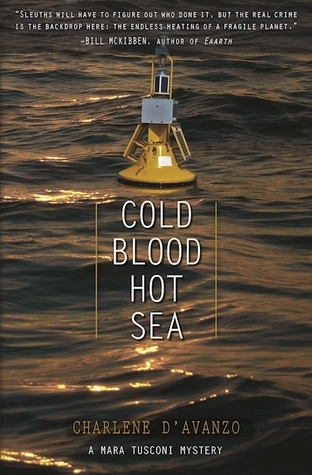 To ask other readers questions about Cold Blood, Hot Sea, please sign up. Well done mystery that uses climate change as a base but never becomes polemical. Mara is a very likeable character. D'Avanzo has clearly used her personal knowledge of sea kayaking and oceanography to write this novel, which is a good way to educate those of us who aren't familiar with either. Thanks to Edelweiss for the ARC- I'm looking forward to the next installment in this series. You will like this if you like mysteries with smart women and you like to learn something new. Good job! 3.5 stars. A very entertaining read about an oceanographer working in Maine. Suspenseful and a quick read. The author was a professor at Hampshire College, where I currently work, which is how I discovered this book. I really enjoyed and I recommend this lovely mystery. I like strong female leads and a book where you feel like you learn about a new industry while you enjoy a mystery. Having lived in Maine before I enjoyed all the references to Maine. I gave this book the highest rating. Charlene's knowledge of oceanography and environmental issues as well as her experience paddling the coast of Maine makes this an entertaining mystery. Her characters are well drawn, especially the protagonist Mara. This is a well written, researched and thought-provoking mystery. Emotionally charged, wonderful characters and I simply love the cover! I enjoyed this immensely. The combination of climate change science, oceanography, and a neat mystery makes for a great read. And Mara Tusconi is a fascinating character, both as scientist and detective. A real page turner! Loved the way the author wove mystery and climate science together. A great read and also educational. This story, billed as “A Mara Tusconi Mystery,” introduces Mara, age 31, whose work at the Maine Oceanographic Institute (MOI) centers on the timely subject of climate change. D’Avanzo deserves credit for taking on the difficult task of making a science topic accessible to a general audience and taking advantage of the possibilities for drama inherent in this contentious field. The story holds several key points of friction. First, between Mara and an aquaculture startup corporation up the Maine This story, billed as “A Mara Tusconi Mystery,” introduces Mara, age 31, whose work at the Maine Oceanographic Institute (MOI) centers on the timely subject of climate change. D’Avanzo deserves credit for taking on the difficult task of making a science topic accessible to a general audience and taking advantage of the possibilities for drama inherent in this contentious field. The story holds several key points of friction. First, between Mara and an aquaculture startup corporation up the Maine coast a short distance, which she believes may be fudging its data—anathema for any reputable scientist. And, second, between her fellow climate researchers and an apparently well funded cadre of climate change deniers who increasingly resort to spying, sabotage, and threats of physical violence. She has her personal issues as well: she gets seasick easily and she’s a behind-the-scenes player, deathly afraid of public speaking. At the same time, she’s trying to persuade Maine lobstermen that her research isn’t the threat, but the underlying changes in sea temperatures that could jeopardize their livelihoods. As the novel begins, Mara and other MOI researchers head out to sea on their ship Intrepid to launch huge data-gathering buoys that will reveal ocean temperature trends. The buoy of her friend and colleague Harvey (a woman) goes into the water without incident. Because Mara is seasick, she turns the launch of her buoy over to Peter Riley, a young MOI PhD. Something goes disastrously wrong with the winch, the buoy slips, and fatally injures Peter. An old MOI hand advises Mara to investigate Peter’s death on her own, secretly. She says the organization’s administrators may try to cover up any problems, in order not to scare off potential funders. Thus amateur sleuth Mara starts on a bit of a whirlwind of plot-driven activity. D’Avanzo gives Mara a large cast of potential allies and antagonists, almost too many to flesh out in sufficient detail. Partly because the novel is told strictly from Mara’s point of view, we don’t get to know these other characters in very well. Stronger characters would create more unpredictability in the outcome and make me more invested in it. When the opportunity arises for Mara to play a more prominent role in the climate change debate, she must weigh the risks of harassment along with the opportunities to make a vital contribution, and her personal strengths against her fears. There's a lot to like about this book: the Maine setting, the plot involving science fraud, and several of the characters. I especially enjoyed the stalwart friendship between the two female scientists Mara and Harvey. And I learned some things about climate science, the email flap involving climate scientists a few years ago, and sea kayaking. The descriptions of the Maine land and seascapes were sure-handed and particular. While the character development was interesting enough, I withheld stars There's a lot to like about this book: the Maine setting, the plot involving science fraud, and several of the characters. I especially enjoyed the stalwart friendship between the two female scientists Mara and Harvey. And I learned some things about climate science, the email flap involving climate scientists a few years ago, and sea kayaking. The descriptions of the Maine land and seascapes were sure-handed and particular. While the character development was interesting enough, I withheld stars because characters were often and annoyingly described by what they wore and eye/hair color. At the start, the book unleashed so many characters at once that it delayed my getting into the story. I grew up in Maine so this book was easy for me to relate to. And I have enjoyed kayaking in Casco Bay, off Portland Maine. So I enjoyed Mara's kayaking, learning to roll in her kayak. I really liked her spying adventure in her kayak at night. The fact that it was April and the water extremely frigid, should she capsize, added to the tenseness of her obtaining sea samples in a place she could not be seen. I could imagine being at the wharf and being on boats and ships. I could imagine Mara's lob I grew up in Maine so this book was easy for me to relate to. And I have enjoyed kayaking in Casco Bay, off Portland Maine. So I enjoyed Mara's kayaking, learning to roll in her kayak. I really liked her spying adventure in her kayak at night. The fact that it was April and the water extremely frigid, should she capsize, added to the tenseness of her obtaining sea samples in a place she could not be seen. I could imagine being at the wharf and being on boats and ships. I could imagine Mara's lobster pet, Homer. I could imagine the sea air and houses with weathered clapboard shingles. The book mentions global warming and how it affects the sea life and water. Unfortunately, Maine waters are really getting warmer. I hope the lobsters stay! What an easy, interesting read. The author does a great job of explaining both sides of the environmental issue while also throwing in a mystery. I read this book as part of a virtual book club. I found the book to be perfect for a book club because there was a lot to discuss. I'm looking forward to reading the next one! This is a Mara Tusconi Mystery. Mara investigates the death of a scientist killed on the research vessel Intrepid. As she encounters the circumstances surrounding this death she believes it was no accident. She puts her career and life on the line. A good solid mystery that will keep you turning the pages. I received this book free through Goodreads Giveaways for a review. good cli fi mystery. not exactly high art but a page turner. Why does a marine ecologist/college professor turn to mystery writing? Easy. What could be more mysterious, dangerous, and riveting than the deep, dark sea? I write the Mara Tusconi Maine Oceanography Mystery Series. Mara's a feisty scientist who uses her sea kayak to track down the bad guys. "Cold Blood, Hot Sea" (2016) is a Foreward Review Indie Mystery finalist. Mara witnesses the death of a de Why does a marine ecologist/college professor turn to mystery writing? Easy. What could be more mysterious, dangerous, and riveting than the deep, dark sea? "Cold Blood, Hot Sea" (2016) is a Foreward Review Indie Mystery finalist. Mara witnesses the death of a dear colleague aboard research vessel Intrepid. It's called an accident, but Mara is convinced otherwise. She risks her job and life as she uncovers a scam as deep and dark as the wild sea. "Demon Spirit, Devi Sea" (May 2017) takes Mara to one of the last temperate rainforests on earth - Haida Gwaii, an archipelago 50 miles off British Columbia. As Mara investigates an international law of the sea crime. she confronts spiteful spirits that shouldn't exist and a baffling death.